Whether you absolutely love Halo or you feel it’s worse than the plague, few would deny that Combat Evolved was both a key component in preventing the Xbox from complete failure and in helping bring first-person shoot ‘em ups to consoles after games like GoldenEye laid the groundwork. For me, however, the series hasn’t fully evolved and mostly follows a formula that admittedly works, but never leaves me as excited as some. Halo 4 has a lot of pressure riding on it, being the first main instalment to be developed by 343 Studios and not Bungie. Perhaps in fear of a backlash, 343 have played it safe, delivering a solid and fun shooter, but one that isn’t revolutionary. If you haven’t kept up with the Halo franchise and its story, you may as well give up. Taking place a few years after the events of Halo 3, Forward unto Dawn is at risk of crashing, so companion AI Cortana wakes Master Chief as Covenant board the ship. The looming threat of the Didact must be stopped, and on top of that a Marine vessel called Infinity is dragged into the gravity well of Requiem. Chief must stop the power of the Didact and save those on Infinity. It can feel a tad jumbled, especially if you haven’t been keeping up with the series. But anyone can appreciate the emotional interaction between Chief and Cortana, as her Rampant status puts her at risk of dying. It’s a shame those who don’t invest in the series’ lore feel alienated by Halo 4. Much of Halo 4 is built around the franchise’s established concepts and formula. The game is linear, but a lot of battles take place in spacious environments which can offer differing tactics. Covenant forces return, but a new race called Prometheans have also entered the fray. It’s a shame they are united so quickly, as one of the cooler moments is watching Covenant and Promethean forces battle each other. Additions made in Reach return here too, mainly the Armour Abilities. New ones have been added, including Thruster packs which blast you in a forward direction quickly. It’s certainly good that 343 opted to include the additional features from the last game, giving it more ingenuity in comparison to Halo 3, even if there isn’t a huge difference from Reach. A couple of other things sadly drag down the campaign from being stand-out. Playing on Legendary is the way to go, as the brutally challenging A.I. will respond to your tactics and show little mercy in gunning you down. Yet, on the lower three difficulties, it feels like 343 just didn’t take the time to offer any challenge. Even on Heroic, you can easily run past entire gunfights. The A.I. never comes close to feeling as advanced, and it’s just too easy. Levels can also feel drawn-out, perhaps due to the fact each mission usually is split into sub-missions. The campaign can also be brief on lower difficulties, taking less than eight hours. It is solidly old-fashioned fun, but not a world-beater. Co-op isn’t a whole lot better, feeling dated as four clones of Master Chief run around the battlefield. It can be pretty fun on Legendary though, thanks to the challenge offered. There is also a full-fledged co-op mode present: Spartan Ops. This mode takes place four months after the events of the campaign, and involves members of the UNSC Infinity returning to Requiem to stamp out remaining Covenant and Promethean forces. The mode certainly gives you a nice first impression, with gorgeous CG cutscenes and a more direct story. However, the gameplay feels light, with short missions and a lack of challenge due to infinite respawns, meaning it feels like a missed opportunity. Those still finishing the fight on Halo 3 can safely upgrade to Halo 4’s multiplayer suite at least. A notable improvement is the addition of customisable loadouts which include Armour Abilities. These really make for a different kind of Halo multiplayer, diversifying the battlefield a great deal. Ordinance Drops can also be called in, allowing for boosts as you earn kill streaks. Many of the fun game types are still here, such as Infection and Grifball, as well as interesting new modes such as SWAT, a variant on Slayer which adds armour all over except for the head, demanding precision kills. Forge and Theatre features also return, with the former seeing some nice improvements such as easy object attachment and special Forge maps. Overall, multiplayer is great fun. Halo 4 is an audiovisual treat. Large environments bustle with great lighting and detailed texturing, making exploring the battlefield easy on the eye. The same tech that powered LA Noire is used in the cut-scenes, and it’s even better here, though character models look a little dated elsewhere at times. Thankfully, the frame-rate troubles are minimal bar some spots of high intensity. The sound is great too, with the music standing out most as grand symphonies combine with synth-heavy tunes. Voice-acting is good, especially Cortana whose jokes tend to lighten up the gunfights. Sound effects are mostly the same as before, but the new Promethean weapons sound pretty good. 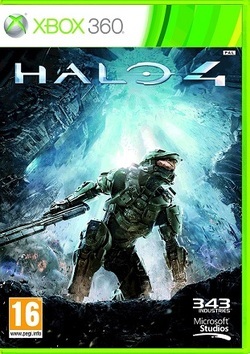 Halo 4 is predominately a good shooter, with solid gunplay, spacious combat and tactically deadly A.I. provided you play on Legendary difficulty. 343 just haven’t crafted a game that will appeal to anyone outside of the Halo elite, and campaign woes rear their ugly head. Multiplayer is divided: the competitive stuff is ace, with the loadouts and armour abilities invigorating the War Games, but Co-op – whether in campaign or Spartan Ops – adds very little. Those who have yet to enlist in Halo will find themselves feeling cold, especially as the story is difficult to dip into without prior knowledge of the earlier games, but fans looking for more of the same will find plenty to like here.